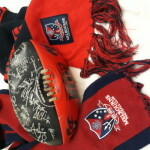 Gorgeous autumn weather drew big crowds to the footy in Melbourne over the weekend . Several close finishes thrilled fans who revelled in the sunshine and fast paced action. 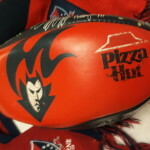 The Demons played the Eagles on Saturday night at the MCG , a game which saw both teams play in dark blue football jumpers . 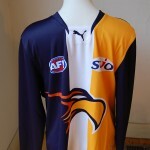 A navy blue home strip was worn by the Demons , and a dark blue clash strip was worn by the Eagles . 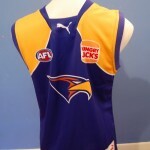 Surely a better choice would,ve been for the Eagles to wear white or yellow guernseys , under lights , at night ? 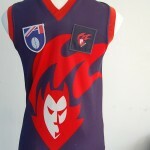 Several Demons players hand - balled to the opposition on a least two occasions in the second quarter . 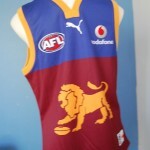 It didn't affect the result of the game , but the AFL need to adopt a pragmatic approach to the wearing of home and away strips , of teams football jumpers , jerseys , guernseys. 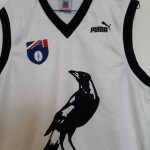 Its Round 21 in the AFL with only 3 more games to play for season 2012 .The top three spots on the ladder are filled by , bird mascots , the Swans , Crows and Magpies . Following are the Hawks and Eagles , even more bird monikers . The race for the Finals is on . Essendon and Fremantle battle for eighth spot , ahead off the Saints and Blues ,who appear to be out of contention on tenth and eleventh spot respectively . to contract extensions , whilst other players talk retirement. 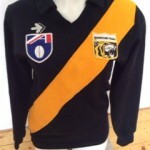 Football fans, are battle weary after a wet, cold season . Many are keeping the belief that their team will be triumphant in September . 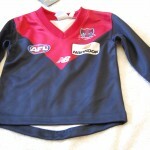 All are getting along to matches wearing their football jumpers , jerseys , guernseys . 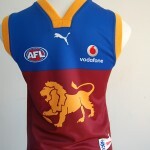 In an incredibly close finish the Lions beat the Eagles , at the Gabba , on Sunday afternoon, by 2 points . 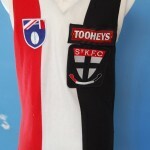 The Dogs were thrashed by Sydney at the SCG , and the Magpies annihilated the Suns on a cold , windswept MCG. In that other harbour city , the Cats whipped the Giants in Geelong . Beatings by large margins , has left some teams in turmoil . Suprise , upset wins by others , provided fascinating entertainment over the weekend. 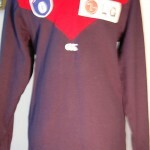 Fans , wearing their football jumpers , jerseys , guernseys were treated to superlative entertainment . 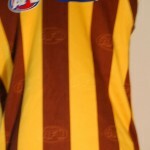 AFL football has truly earned the title " sport of the people " , delighting all with the brilliant weekend efforts .